Ask MSNBC Morning Joe co-host Joe Scarborough why he is a fierce critic of President Trump and he will give you the "I didn't leave the Republican Party, the Republican Party left me" speech. As Scarborough tells it, he is still the same conservative that was elected to Congress back in 1994 and that unlike the Republican Party, which has debased itself in its embrace of Trump, he still cares about the Constitution. 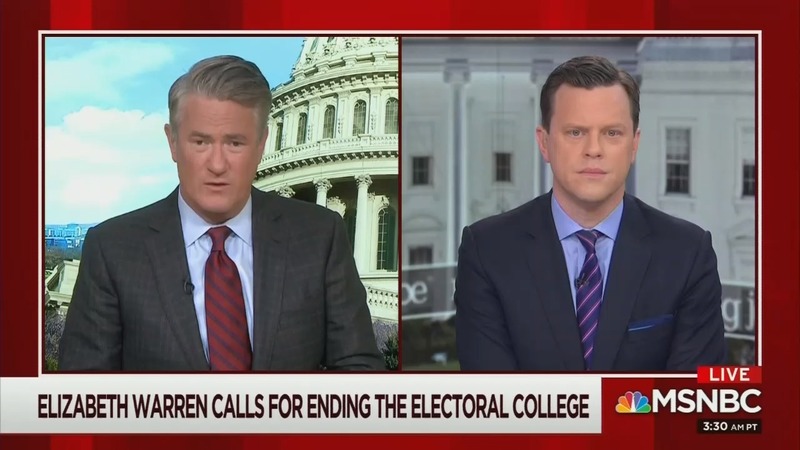 During a Tuesday segment, the self-proclaimed defender of constitutional norms came out swinging against the Electoral College and suggested that the only reason Republicans refuse to do away with it is because it has benefited them twice since 2000. After co-host Mika Brzezinski kicked off the segment with a video of Democratic presidential candidate Elizabeth Warren telling a town hall audience that she favored eliminating the Electoral College, Scarborough interrupted to ask co-host Willie Geist to consider the fact that two of the past three Presidents have not won the popular vote. "For a nation that believes in 'One Person One Vote,' that's just not a system that can, that really can continue effectively much longer if this happens again." Geist began his response by saying that the Electoral College can be difficult to explain to children, but that it does have some legitimate reasons for existing. He then went after the real reason why Warren and her fellow Democrats want to get rid of the Electoral College, "I know that these senators and congress people would not be speaking out so clearly if the election and gone the other way."